Here's our latest update on the beers we have on draught at the Black Heart this week. We’ve got a variety of IPAs and golden ales, as well as a sour cherry ale, a a raspberry fruit beer, and a coffee and vanilla porter. First, the IPAs. We’ve got Swedish brewers Beerbliotek and their Crazy in the Coconut IPA. Packing big aromas and flavours of citrus/tropical fruits, bitter zest, yeast, malt, hops, and a mild taste/aroma of toasted coconut. Refreshing and tasty. 6.8%. Then we have Huddersfield massive Magic Rock with their Cannonball IPA. Made in the “true tradition - high in alcohol and massively hopped”, the Cannonball is tropically fruity, with aromas of citrus, peach, and tangy orange. Resinous hops are paired with a sweet malty backbone, while the lip smacking bitterness follows the soft, light, well-balanced body. 7.4%. Next we’ve got the fruity brews. Manchester’s Chorlton brewery and their Cherry sour, a red/brown ale. Pouring deep reddish brown and medium bodied, the Cherry’s aroma is earthy and roasty, with notes of cherry cola and ripe cherry. The taste is toasty, tart and tangy, with sour cherry and ripe berry flavours. 5.4%. Then it's the Raspberry Pale from Norway's Ægir Bryggeri. Pouring a hazy reddish/orange and fairly light in body and bitterness, the Raspberry Pale is semi dry, with mostly raspberry and lemon notes in the flavour, and some pale malt. The aroma is sharp and dry, with more traces of raspberry, lemon and malt. On to the golden/blonde ales now, Brooklyn’s Summer Ale and Thornbridge’s Wye. The Summer Ale is a “modern rendition of the ‘Light Dinner Ales’ brewed in England throughout the 1800s until the 1940s”, which were big on flavour and refreshment without the heaviness. The Summer Ale’s English malt gives this light-bodied beer a fresh bready/wheat flavour, while its German and American hops provide a light, crisp bitterness and floral/citrus aromas. 4.5%. Thornbridge’s Wye is a crystal clear pale ale lightly hopped with the aroma of cucumber. 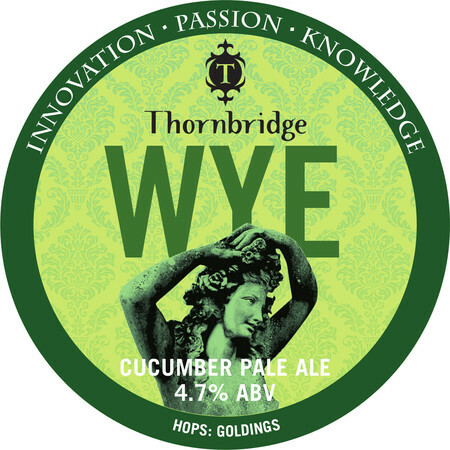 The Peak District brewers have made sure the cucumber is present but not overbearing, and the Wye’s flavour/aroma is also fruity, earthy, and malty. Medium bodied, with a dry, slight bitterness. 4.7%. Finally, we end with Fierce Beer’s Cafe Racer. I’m not sure there’s anything good to have ever emerged from Aberdeen - my place of birth - but the Cafe Racer is a serious contender for proving me wrong. This dark roasted coffee and vanilla porter pours rich and black, with a slight tan head. Its aroma is roasted malt, coffee and vanilla, and its taste is of coffee, vanilla essence, and dark chocolate. Medium body with a complex, bitter chocolate finish. 6.5%.